In a world that hates and fears them, Professor Charles Xavier and his X-men try and fight for peace. But at the moment, peace seems like a far off prospect as they fight for their lives in the face of all out war. It all started with Magneto, a former friend of Charles Xavier, who now seeks to overthrow humanity and create a new order dominated by mutants. After assembling his Brotherhood of Mutants, he staged a daring attack on the embassy of Genosha. This attack signaled the beginning of a massive uprising that brought mutants together from all over the world. With an army now behind them, including the estranged Lorna, Magneto brought his fellow mutants to the shores of Genosha where a major battle was already going on. In an effort to mitigate the conflict, the Charles Xavier and his X-men flew to Genosha with the intention of finding its tyrannical leader, Cameron Hodge. But when they arrived they uncovered a horrific plot to exterminate all the island’s mutants using a sophisticated new weapons system known as the sentinels. The X-men managed to thwart Hodge’s genocidal efforts, but the fight to stop his sinister plans continues to rage. And now that Magneto has entered the picture, the stage is set for the ultimate clash. The battle for mutant supremacy had begun and spearheading the attack was Magneto, the leader of the Brotherhood and the chief organizer of this attack. The target was Cameron Hodge and his tyrannical regime that drew power from oppressing mutants. But the madman had already shown he would not go down easily. Just as Magneto and his mutant army approached the Genoshan coastline board a large metal disk they came face-to-face with the advanced mutant containment system that Hodge had been boasting about. They were the sentinels and when they saw the army of mutants before them they began their attack without hesitation. Sentinels from all over the island received the command. Hoards of the robot humanoids followed their programming and converged on the attacking mutant army. Before any of the mutants could even disembark, the sentinels took off and started shooting with a relentless assault of laser attacks. But Magneto was ready for this. “Father! I see more coming this way!” said Wanda as she looked into the distance. “I see them too. They a minor inconvenience,” said the Master of Magnetism. He then turned to Pietro and nodded, who went onto carry out his orders. “You heard the man! Let’s get this party started!” exclaimed Pyro, already brimming with excitement. The hundreds of mutants, ranging from different backgrounds and nationalities, followed the orders of their leaders. They split up and formed dozens of smaller groups, just as Wanda and Pietro had told them to do earlier. They made sure that their group contained mutants with a specific set of powers. They had to have someone with firepower, defensive powers like telekinesis, and healing abilities. Once in place Magneto clenched his fists, pushing his powers again in preparation for yet another show of great force. Just as the sentinels were starting to converge, a deafening rip echoed from the metal disk as it fractured into dozens of separate sections. Each section carried a group of mutants out and flew them down towards the chaotic battleground below. As soon as they were in sight of the sentinels, they started attacking. Mutants with firepower such as electrical bursts, rock blasts, ion pulses, seismic waves, and fireballs unleashed a relentless attack that disabled a handful of sentinels immediately and slowed down many more. As the chaotic sounds of war and destruction erupted on the Genoshan coast, Magneto continued to hover above the battlefield atop a shard of the metal disk. His Brotherhood remained with him. Lorna stayed by his side, keeping to herself and trying not to look at the carnage unfolding before her while Toad, Avalanche, Pyro, Blob, Quicksilver, Mystique, and the Scarlet Witch were all poised for battle. “Don’t worry. We won’t fail,” assured Mystique as she brandished her guns. They were as confident as they were eager. Hopefully that would carry them through this part of the battle. Magneto used his powers once more to fracture the shard of disk they were on, creating a nice chunk for the Brotherhood to fly off on and descend onto the battlefield. But unlike the rest of the mutants, they were flown further into the heart of the Genoshan coastline over teams of swarming sentinels. As tempting as it was to just swoop down and join the fight, they had more pressing targets. They stayed on course until they were right over the first major garrison, which consisted of a series of apartment buildings surrounding a military bass that was walled off and heavily guarded. It was manned by both soldiers and citizens, all of which were armed to the teeth with high powered automatic rifles, anti-aircraft guns, and rocket propelled grenades. There were also a number of sentinels in front guarding it and as soon as they detected the Brotherhood coming in, they started shooting. In addition, the officers in charge of the garrisons ordered their citizen army to start shooting. The lead soldiers fired without hesitation. The conscripted citizens, nearly all of whom were here against their will, trembled at the sight of the mutant army bearing down on them. But they did as they were told and started shooting. Their attack did little to slow the Brotherhood down. They kept coming as they rode atop the metal disks. The Scarlet Witch used her hexing powers to deflect the incoming rounds. They then waited until they were hovering directly over the two sentinels guarding the entrance before beginning their attack. “With pleasure!” grinned the oversized mutant. Now directly over top of the sentinels, Blob leapt off the floating metal platform and plunged right on top of the head of one of the robot humanoids. He literally belly flopped onto it, his massive weight causing him to blow right through the head and come out through one of the legs. It effectively disabled the sentinel and drew more fire from the garrisoned troops. “Nice dive, Freddy! Now it’s our turn!” proclaimed Pyro. Pyro, Avalanche, Toad, and Quicksilver leapt off the platform as well to join their friend. Then using Blob as a protective shield, they began their attack. Pyro created massive balls of fire and used them to torch the outer defense sentries, setting soldiers on fire and exploding any spare ammo that was lying around. Avalanche and Toad attacked the sentinel with Avalanche triggering a tremor that knocked the sentinel off balance while Toad spat a huge glob of slime at the face of the robot, effectively blinding it while it fired wildly. Quicksilver backed up Pyro, running at high speeds around the outer garrisons and drawing their fire. As he got close he disarmed as many soldiers and conscripts as he could. “Please! Don’t hurt me! I surrender!” trembled the conscript. “Wow…and Wanda says I don’t have a backbone,” snickered Pietro. The speedster showed some mercy and just knocked them out before moving onto more garrisons. It wasn’t long before the whole area was in a state of disarray. While Quicksilver and the other Brotherhood members drew their fire, Mystique and the Scarlet Witch continued to ride the metal disk until they were directly over the central base. This was the target Magneto specified for them earlier. He emphasized that this facility would play a significant part in what he had in store for these humans. With daring skill, the shape shifter leapt off the platform and descended towards the structure below. Despite bullets and grenades flying past her, the Scarlet Witch steadied her descent with her hexing powers while deflecting incoming rounds. It was chaotic and disorienting, but she held strong until the shape shifter crashed through a window and went to work. Once she was inside, Wanda turned her attention to the rest of the Brotherhood. The battle was just beginning and their grandest stand was yet to come. While the Brotherhood did their duty, Magneto hovered over the coastline where the bulk of his mutant army continued to fight. He watched as hoards of mutants attacked the sentinels, downing and disabling them even as reinforcements swarmed in. He saw mutants with super strength literally trip the lumbering behemoths. He saw shape shifting mutants turn into animals that could scale them and then attack the heads. Other mutants who were agile and nimble drew the fire of some sentinels to the point where they shot others. Those with firepower like solar blasts and force projections provided the destructive power that stopped these monstrosities in their tracks. There were those who were unable to avoid the sentinel onslaught. Some were struck by their laser attacks while others endured crushing blows as the sentinels stomped and punched their way around the rugged terrain. Any mutant with healing powers tried to do what they could, but there were bound to be casualties. Magneto didn’t mind this one bit, but it struck Lorna very hard. She had never seen a war before and just listening to the sickening sounds of combat made her sick to her stomach. “How much longer does this have to go on?” she lamented, trying not to look down at the scene below. “As long as it has to,” said Magneto stoically. “I know. Don’t remind me,” she said, still looking away. Lorna fell silent as her expression hardened with a mix of resentment and bitterness. It was bad enough her father was a cold, dark, tyrannical man with ambitions of overthrowing humanity. But getting caught up in his plans like this was difficult on any number of levels. She couldn’t believe she was going along with this. But what choice did she have? She didn’t have the luxury of being able to rebel. She could only watch and wait, praying that something would come along to change the outcome of this war. The battle against the sentinels had been taxing on the mutant prisoners of Genosha. Even with the help of the X-men, the poorly nourished mutants could not overcome fatigue and exhaustion as the sentinels kept attacking. Cyclops, Marvel Girl, Iceman, Kitty, Angel, Rogue, and Wolverine kept their guard, protecting groups of weakened and injured mutants. There were a couple of healers in the crowd, but they could only do so much and Hodge wasn’t running short on sentinels. “Hrrrrraahhhhhhhh!” roared Wolverine as he literally decapitated another sentinel. “Watch your back, Wolverine! We got two more heading our way!” warned Angel. “Be careful what you wish for! I have a feeling this isn’t the best Hodge has to offer!” said Cyclops as he defended two injured mutant boys. “Do you have to jinx it like that, Cyclops?” groaned Kitty as she protected the X-leader from an incoming laser blast. “With luck like ours, it doesn’t make a difference,” said Iceman as he created an ice wall to protect another group of prisoners. While various mutants took cover behind Iceman’s ice wall and Marvel Girl’s telekinetic shield, the rest of the X-men took out the attacking sentinels. Cyclops used is optic blast to knock off an arm from one of the sentinels while Wolverine pounced onto the massive humanoid and finished the job. For the other sentinel, Rogue absorbed the powers from a couple of prisoners unable to fight. One of them had the ability to heal their body by shifting it into a liquid-like state and another had the ability to fire concentrated balls of energy through their hands. Using those powers, Rogue shorted out the visual sensors of the sentinel while it tried to shoot her. Angel then took care of the rest by flying Rusty up from the crowd so he could unleash the full force of his fire-conjuring attacks. “Yeah! That the best you got, Hodge?” proclaimed Rusty. When the two sentinels fell, the X-men gathered in the central area again where most of the prisoners still were. They had a brief window to catch their breath while the sentinels regrouped. Marvel Girl was finally able to lower her telekinetic shields and rest her mind. Cyclops was also able to reassess the situation. But they had more problems than just defending themselves. There were a lot of mutants here and not all of them were in the best of shape. Some looked like they had some fatal wounds and many weren’t going to last if this battle continued. Kitty and Angel knelt down to help a few. Marvel Girl did so as well, trying to use her mind to ease the suffering of some. “We have to get them out of here! They won’t last long at this rate!” said Marvel Girl. “Are you kidding? I’m not leaving until I get a shot at that prick, Hodge!” yelled Rusty. “Yeah!” yelled a collection of other prisoners. Even among the injured, the sentiment was the same. Many wanted a chance to repay Hodge for the suffering he inflicted on them. “What gives you the right to say what we do with our lives? !” exclaimed Rusty. Rusty muttered a curse as he fell silent. That same sentiment resonated as well. The X-men saved them all when they were facing certain death. That leant them credibility at the very least. “I’m hoping you’ve got a plan here, Cyclops,” said Angel. “How long will that take?” groaned Rogue. They watched as another dozens sentinels flew in through the holes in the dome made earlier. They all set their sites on them and the hoard of mutant prisoners behind them. Cyclops placed his hand on his visor as the rest of the team prepared for another fight. But just as they were about halfway to their position, they abruptly stopped. The high tech AI of the sentinel system worked out the many computations. Then to the surprise of the X-men and the prisoners, more than half the new attack force broke off and flew out of the dome. And for those that did stay, they remained high above ground below, well out of range from any attack. It wasn’t a retreat, but it wasn’t a new offensive either. Something was off here. “The hell? Why ain’t they attacking?” said Rogue. “I don’t know,” said Cyclops curiously. “Are they giving up or something?” said Kitty. “So long as they’re not attacking, I’ll take it,” shrugged Iceman. The feral mutant then turned to Angel. “You’re kidding, right?” said Angel warily. “Do I look like I’m kidding? !” exclaimed the feral mutant, his claws still drawn. It was pointless to ask, but Angel was still wary about it. His wings had already been singed a couple of times during the first attack. The idea of flying back out there and back into the line of fire wasn’t very appealing. But Wolverine had an unlikely supporter. “I can’t believe I’m saying this, but you may be right, Wolverine,” said Cyclops. “Oh my god, I should have brought my camera!” commented Marvel Girl. “I’m as shocked as you, Jeannie,” grinned Wolverine. Cyclops then turned to Marvel Girl and Kitty. “And chasing after giant killer robots helps with that? Sure, that makes total sense,” said Iceman dryly. “Shut up, popsicle! It’s a better plan than just sittin’ around here waitin’ for Hodge to attack!” said Rogue. That comment earned an angry look from Rogue as well as Scott and Jean for that matter. Only Angel and Kitty found it funny. “Make another comment like that, Iceman, and you’ll be beggin’ to fight a hundred of these things by yourself!” said Rogue with a threatening yet wry look. Nobody said another word as Cyclops, Wolverine, Rogue, Iceman, and Angel gathered and took off in pursuit of the sentinels. Angel grabbed Wolverine by the arms and flew him up towards one of the holes in the dome while Iceman formed an ice slide for him, Rogue, and Cyclops to ride so they could follow close behind. Some of the mutant prisoners like Rusty and Rictor were tempted to go, but they weren’t X-men. All they could do was hope that they knew what they were doing. Once the others were out of the dome, Marvel Girl and Kitty went back to tending to the injured and wounded among the prisoners. Kitty was in a bit of shock seeing so many prisoners in such bad shape. She could only imagine the kind of horrors they suffered. This was the darker part of heroics. She leaned on Marvel Girl for support. Even after they were gone, they looked up at the sentinels still looming over them and worried. “How much longer can this go on?” said Kitty as she helped a young mutant girl tend to her wounds. Cameron Hodge was beginning to feel the pressure of this escalating situation. These mutants were more well-organized and cunning than he thought. Watching images streamed in from the sentinels, he saw that Magneto and his invasion force were more than just a blunt force attack. They seemed to have a real strategic objective. He was already getting reports from one of the garrisons that some shape shifter was infiltrating their communications systems. They couldn’t surmise why Magneto would want to do such a thing, but Hodge was convinced it was something he didn’t want to succeed. Then there were the X-men. They entered the picture sooner than he expected. It was amazing enough that jet of theirs was able to escape detection from his early warning radar system. It was even more amazing how they were able to free all the prisoners and rally them to defeat an entire onslaught of sentinels. Now they seemed to be diverting their attention to the war on the coast with Magneto. If they linked up they could be even more formidable. Impressed or not, such cunning would not do them any good. Hodge anticipated that the mutants would be able to hold their own against the sentinels in their most basic state. That’s why he went behind Trask’s back to add in some ‘upgrades’ so to speak. Once the mutants, and the rest of the world for that matter, saw them, they would understand the futility of opposing him. Magneto maintained his stoic poise as the battle on the coast intensified. His expression remained hardened and steadfast as he used his magnetic powers to assist his army. He barely broke a sweat as he casually swirled his wrist, causing the head of a sentinel to literally rip in half while a hoard of his mutant followers swarmed around it and picked it apart. It was a glorious feeling, leading this uprising of mutant solidarity against a tyrant. With every sentinel that fell, his forces became more emboldened. “FOR ALL MUTANT-KIND!” cheered the army. Such solidarity brought Magneto a strong sense of satisfaction. His only regret was that there weren’t more mutants to join him. Even as the sight of dead or injured bodies from mutants unable to hold their own came into view, Magneto held firm. This attack would not stop until humanity realized their time was up. Lorna stayed close to him, keeping her silence and only occasionally using her powers to save someone who was in the line of fire from a sentinel. She continued casting cold glares towards her estranged father, but he ignored every one of them. Nothing else mattered now. Only victory in this war concerned him. While he was doing his part he kept in close contact with the Brotherhood via radio link, who were making quick work of the garrison they had been assigned to attack. “Quicksilver, what’s your status?” he said into the link. Magneto then shifted gears from Pietro’s frequency to Mystique’s. Hers was encrypted because for her to succeed with what he had in mind, she had to remain hidden. “And you’ll have plenty,” assured Magneto. It seemed like an easy enough promise to keep as Magneto clenched his fist, ripping the arms and legs off another sentinel. But then something unexpected happened. It was something that caught both him and his mutant army entirely off guard. The sentinels stopped attacking. The sentinels on the ground fighting just stopped shooting and froze in place. Even as Magneto’s mutant army kept up their assault, the sentinels took off and flew up to a higher altitude where they could not be so easily attacked. The other sentinels that were flying in from afar as backup stopped as well, halting in mid-flight and hovering in a stable position. “Cowards! I wasn’t finished with you!” exclaimed a wolf-like mutant. “What the hell are they doing?” said a female mutant with a glowing green energy aura. Magneto’s gaze narrowed with suspicion as he watched the sentinels. He noticed their eyes suddenly change from red to blue. They appeared to be initiating some new kind of tactic. Then to the surprise and horror of many, the panels in the chest of the giant robot humanoids opened up to reveal a menacing new weapon. It was a large high-tech cannon built right into the chest of the behemoth. But it was no ordinary cannon. This had a mysterious blue glow to it, hinting at a powerful source of energy. As more and more sentinels revealed this weapon, many of the mutants who had been so emboldened suddenly felt more vulnerable. “Father? What’s happening?” asked a worried Lorna. Magneto didn’t say a word. His stoic gaze remained locked on the sentinels, watching as the mysterious energy built up around the chest of one of the sentinels. It appeared to be charging up. Within seven seconds, a huge ball of glowing blue energy formed around the cannon. Then in a sharp burst of energy, one of the sentinels fired their pulse straight into the heart of the battlefield where so many mutants were still standing. Gasping in horror, hundreds of mutants scrambled for cover. While a few had the speed and invulnerability to get out of the way, there were still many who wouldn’t be so lucky. The young woman reacted on a whim, summoning the full force of her powers to deflect the incoming energy blast. But it wasn’t enough. Just a few hundred feet above the target area, the energy blast exploded in a bright burst that illuminated half the sky. It was a like a miniature nuclear explosion, only much more concentrated. The shockwave knocked half of Magneto’s army off their feet. Dozens were seriously injured. A few were even killed. It marked a horrifying turning point in the battle. Apparently Cameron Hodge was more cunning than they thought. More sentinels began charging up to fire their deadly weapon. But even as fear and panic settled over the hoards of the mutant uprising, Magneto himself just stood there in a daze. “Father! We have to stop this! We can’t win a fight against firepower like that!” she exclaimed. But he didn’t budge. To the bewilderment of the young woman, he actually smiled. “Father!” she yelled in a fit of anger. With renewed determination, the master of magnetism opened the communication link to Mystique. He suspected Cameron Hodge might pull something unexpected on him and his army. But he was prepared for it. And while the price of victory may have just gotten much higher, the breadth of his goals just became all the more attainable. As Kitty and Marvel Girl did their best to tend to the prisoners, they kept their eyes on the sentinels that hovered overhead. Moments ago they noticed a strange shift in them. The chest plates in each unit opened up to reveal an ominous new weapon. The sight of the strange built-in cannons with glowing blue energy inside was enough to make even the hardened prisoners anxious. Rusty and Rictor backed off a little, letting some of the younger and injured prisoners stay behind them. The hunch the other X-men had pointed out earlier was starting to make a lot more sense. “What the hell are they doing?” wondered Rusty. “I don’t know, but I don’t like it,” said Kitty. Nobody argued with her order. Rusty, Rictor, and a number of other able-bodied mutants helped the young, the sick, and the wounded into a concentrated area so Marvel Girl could protect them. They watched as one of the sentinels started charging its chest cannon. As the glow intensified the prisoners grew increasingly anxious. If this was going to be as powerful as it looked then the young psychic may not be able to protect them. Some briefly contemplated running away, but the X-men had protected them thus far. Their best chances remained with them. Once the sentinel had charged up, it locked onto them and prepared to fire. Every mutant in the crowd could feel it and braced themselves for the worst. “I’m not liking these odds,” groaned Rictor. “You’re in good company,” said Rusty. The mutant prisoners braced themselves as the sentinel look down at them with its cold, mechanical gaze. Then in a blinding flash, it fired the concentrated round of energy. As soon as it was fired, Marvel Girl put all her mental strength into a telekinetic shield. In a split second, the whole area was consumed by a blinding bluish/white light. Then they heard the deafening blast of the surrounding area being pulverized around them. It was so bright nearly everybody had to shield their eyes. Many expected the worst, but the powerful psychic’s barrier held. But the strain it put on Marvel Girl was too much. “Augh!” exclaimed the young psychic as she clutched her head and fell to the ground. Even after the light faded, a large amount of dust and debris was kicked up. Kitty fought through it, covering her mouth and rushing to the aid of her teammate. She found her lying unconscious on the ground, a slight trail of blood tricking down her nose. She must have really pushed herself. It didn’t look like she was going to be able to muster another barrier like that. For all Kitty knew she might not be able to stay in this fight. But the sentinels were just getting warmed up. Looking up, she saw a couple more starting to charge their chest cannons. Without Marvel Girl’s protection they had little chance. Groaning in frustration, Kitty felt all eyes on her now. She was the last remaining X-man. “Is she okay? Can she protect us again?” asked Rictor. “Great! Now what do we do?” groaned Rusty. “Please tell us you can do something!” cried an older mutant woman desperately. “Yes! You’re an X-man!” said another injured mutant teenager. Kitty looked at the unconscious Marvel Girl and then at the group of desperate and weakened prisoners. She hadn’t been an X-man for very long and already she was being thrust into a serious situation. She had never dealt with anything remotely like this. But they had no one else to turn to. And as her uncle once told her, she either had to step up or step aside. So she made a decision. “Spread out? That’s your plan? !” exclaimed Rusty. Nobody had time to debate her orders. Despite injuries, weakness, and despair the mutant prisoners got together and started spreading out as much as they could. Anybody who was able to move helped someone else who could not or was too hurt and started running and stumbling off in all directions. Kitty helped Marvel Girl, who was still trying to gather herself. She helped her up and let her lean against her for support as they started stammering away. But up above, another sentinel was ready to fire. The mutant prisoners moved as fast as they could, but the sentinel still fired another concentrated energy burst. This time with no barrier to protect them, it impacted the area not far from where they had gathered before. And like last time, the release of energy was truly intense. The blinding flash and deafening burst was accompanied with a devastating shockwave that sent anybody not fast enough to get away flying. Kitty managed to endure it by phasing her and Marvel Girl through it. But when the light faded and the dust settled she saw that a number of mutants hadn’t been so lucky. It was a sickening sight, watching some prisoners die at the hands of these monstrous machines. But Kitty held back her disgust and fear and kept trying to get Marvel Girl out of danger. More sentinels began charging up and some mutants like Rusty tried to slow them down by shooting fireballs and energy bursts up at the hovering machines. It disoriented them a bit, but didn’t stop them. If they couldn’t find some way to stop this assault, then they wouldn’t last very long. Grunting with determination as she helped Marvel Girl along, Kitty found herself sending a desperate message to Professor Xavier. As the battle raged outside, the fight to reach Cameron Hodge was just as intense. Professor Xavier clung to Beast’s furry frame as they entered through a hole in the top floor created by Storm. As soon as they were inside they were confronted with Hodge’s elite guards. They were heavily armored, heavily armed, and extremely loyal to their leader. They shot at them without hesitation. Xavier used his telepathy to put some of them into a deep sleep, but he quickly found out that Hodge trained his guards to resist psychics. So a good deal of them remained conscious and kept fighting, forcing Storm to clear the way with a punishing assault of wind and lightning. “I have to hand it to Hodge. He knows how to train his henchmen!” said Storm, grunting as she formed a sharp wind burst that knocked a whole hoard of guards back. “Can you get through it?” asked Beast as he kept following Storm. That added some extra motivation to Storm, who concentrated harder as she sent fully formed tornados down the narrow halls of the facility. This forced many guards into hiding before they could even fire their weapons. Glass, debris, and anything that wasn’t nailed to the floor was sent flying and those that weren’t knocked out by it were forced to take cover from it. Every time Xavier, Beast, and Storm made it into a new corridor, they kept more guards from coming by locking the door behind them and blockading it with debris. They moved swiftly, guided by the directions fed to them psychically by Professor Xavier. Using the minds of the guards, he led them down the elaborate passageways of the vast complex. They noticed the deeper they ventured, the more complex and sophisticated the technology. For a small island with a totalitarian regime, it seemed too great for any one man to acquire by traditional means. But Beast and Xavier had no time to stop and ponder this mystery. They had to stop Hodge. Just outside the observation deck, they encountered the stiffest resistance. Hodge’s elite guards had set up barricades and had all their guns pointing in all directions. As soon as they got a whiff of Storm’s wind blasts, they didn’t hesitated. “Open fire!” yelled one of the guards. The three veteran X-men were forced to take cover. For a moment their progress was stopped. They knew they were close. The only thing keeping them from Hodge now was a wall of bullets. It was an imposing obstacle, but one they had to overcome. “I don’t think wind will be enough to get through this barrier, Charles!” said Storm over the hail of bullets. Without a second to spare, Storm’s eyes flashed white again. This time she focused on lightning instead of wind, using the lighting above them as a conductor and a source. With intense focus, she formed a thick storm cloud out in front of her. And with the elemental forces of nature on her side, she concentrated them into a single large burst. Xavier and Beast were forced to look away. But for the guards, they weren’t fast enough. All they saw was a blinding flash. “Ahhhh! My eyes!” they exclaimed. Nearly all were momentarily blinded. The lights around them exploded in a burst of miniature explosions. Some were caught in the crossfire of the sparks and were shocked into unconsciousness. Others that were left disoriented and unfocused, giving Charles Xavier the opening he needed to attack their minds and force them into a deep sleep. Once the sparks stopped flying and the guns stopped shooting, the path was clear to Hodge. All that stood between them now was a secure door. Xavier looked at the unconscious bodies around him and then at the door. On the other side was Cameron Hodge, a man looking to propagate a war using mutants as the catalyst. He spent his whole life stopping men like him. There was little doubt that no peace could ever come if Hodge was victorious. Hodge had been watching with supreme satisfaction as his sentinels assaulted the mutant onslaught. The X-men and Magneto was no match for his sentinels. They were faltering fast. Images of injured and dying mutants on all fronts filled his video screens. And this was just the beginning. They wouldn’t be able to hold out forever. Soon they would be unable to fight on and the world would get an up close view. While this should have been a triumphant moment, he was not oblivious to the commotion just outside this room. He heard the alarms go off as soon as Xavier and his X-men entered the facility. He was confident his elite guard could handle them, but they were proving to be more tenacious than expected. When the lights flickered from Storm’s lightning attack, he started to panic. But he never once considered leaving. He was not about to run at his moment of ultimate triumph. “Sir! I strongly advise we move our operations to a secure area!” said one of his colonels. His guards and officers wisely complied. But he saw some of his technicians and scientists getting nervous. Clearly they weren’t as brave as he was, but they didn’t say a word. They knew full well Hodge wouldn’t tolerate cowardice. While the men barricaded the door, Hodge remained locked on the live video feed from his sentinels. He watched as another concentrated energy blast struck at the heart of Magneto’s mutant army. Even the truly hardened were falling. They were no longer as organized as before. The same could be said for the X-men. They had long since spread out, trying in vain to avoid the sentinel onslaught. But they couldn’t hide forever. Eventually, the sentinels would find them and slaughter them. But he was abruptly cut off. The lights flickered again. Then there was a flash as nearly every light in the area was shorted out. It caught everybody, including his soldiers, off guard. Then all of Hodge’s subordinates clutched their heads and groaned. Even Hodge himself felt it. One by one, they all started passing out. It was a psychic attack and only one man’s name came to mind. He fought the attack, but his subordinates weren’t as lucky. Soon nearly all of them had passed out. Then to his shock and annoyance, the secure door was opened. But it wasn’t through force or blunt strength. Someone had opened it for them. And when Hodge turned around he was shocked to see that it was one of his own officers. The colonel who had warned him earlier had just let his enemies in. As soon as he did, he passed out like all the others. Apparently the psychic shielding he trained them for was not enough. “You weak-minded fools! Do I have to do everything? !” exclaimed Hodge. In a rage the Genoshan leader reached under the console and pulled out an assault rifle he had concealed just in case. . But before he could shoot, Storm hit him with a sharp wind gust. This knocked the weapon out of his hand and sent him flying back against a computer console. Hodge clutched his shoulder, which bore the blunt end of the impact. It felt broken and was stinging with pain. He tried to grit his way through the pain and get up, but he didn’t get far. Soon Beast, Storm, and Xavier were looming over him. With no conscious guards to protect him, he was outmatched and outgunned. Hodge grit his teeth in anger. He should have shot that man on the spot. He clearly underestimated Charles Xavier. For a cripple, this man was quite a nuisance. Despite the pain in his shoulder, Hodge scoffed and laughed. “Ha! Like I’d ever tell you!” scoffed the Genoshan dictator. “You don’t have to,” said Xavier as he clutched his temples again. Xavier then turned towards Beast. “With pleasure, old friend,” grinned Beast. Then to Hodge’s dismay, the ape-like mutant reached for him with his imposing gorilla-like limbs. He was half expecting him to grab his limbs and rip them off like a wishbone. But instead he just casually reached into his ears and pulled out a couple of ear-pieces. Hodge immediately paled because those pieces were special psychic dampeners that he only wore for good measure. They were probably the reason he didn’t pass out like the rest of his guards. Few people knew he used them, but Trask was one of them. And without them there was no way he could resist a psychic onslaught. But that was as far as he got. He was silenced as soon as he felt Charles Xavier enter his mind with his advanced telepathy. His psychic shielding crumbled just as it had with the rest of the guards. From his mind, the Professor could extract all his secrets. What he found completely shocked him. Memories and thoughts dating back years streamed through his mind. In them Charles saw a man not bent on genocide, but on conquest and order. He was a man who spent his life studying war and history. He admired the likes of Alexander the Great, Ghengis Khan, and Napoleon. He saw the world in its current state in a constant state of civil war with humans just fighting amongst each other under the guise of other nations. When he said that mutants had nothing to do with his agenda he was telling the truth. In reality, mutants were just pawns. His ambitions were much greater. “So you could do what? Make yourself dictator of the world?” said Beast bitterly. “At the cost of so many lives and needless suffering?” said Xavier. Xavier’s gaze narrowed on this man. For all his ruthless tactics, he actually did have humanity and mutant-kind’s best interest at heart. In reading his thoughts he could see he sincerely believed that what he was doing was just. In a ways he was not the ruthless madman they thought he was. He wanted peace just as he did, but he was willing to take lives to get it. As he gazed deeper into his psyche he saw that Hodge was without remorse for the suffering he inflicted on the innocent mutants in his prisons. He was willing to take as many lives as necessary for his vision of a peaceful, global community. That was the difference between them. He was willing to live with the consequences of violence. Xavier would not make such a sacrifice. Hodge’s gaze on the powerful telepath narrowed. At that point, they had enough. Storm moved in and knocked him out with a hard right cross to the face. Xavier had gotten the information he needed from him. There was no reason to listen to his psychotic ramblings any longer. As appropriate as her actions were they still caught Beast off guard. “Was that truly necessary, Ororo?” he asked her, smiling sheepishly. “What is that, Charles?” asked Storm. Beast set the Professor down on a chair while he got behind the main console. While many of the lights had been shorted out by their entry, most of the monitors and computers were still going strong. They saw live video feeds of Magneto’s mutant army attacking the coast and the X-men doing their best to protect the prisoners. But it wasn’t looking good for either side. The sentinels had unleashed a new energy weapon that was decimating Magneto’s army and forcing the prisoners to run and hide for cover. Clearly Hodge was more prepared than either of them expected. But Xavier and the X-men knew Magneto well enough to understand that he would not accept defeat. Like Hodge, he had his own ambitions for the world and he would not stop until he succeeded, regardless of how many lives it cost. “No worries, Charles. I’m more than prepared for this,” said Beast as he took out the flash drive he prepared earlier and went to work. “Where did you get that?” asked Storm curiously. Storm didn’t like the subtext of his words. There seemed to be another story behind that. She was tempted to push further, but now was not the time. Then something else caught Xavier’s eye as he went over the various video feeds from the sentinels. One of them was of a garrison not far from Magento’s main point of attack. While much of his mutant army was fighting against the sentinels, the Brotherhood was storming the garrison and neutralizing its defenses. But curiously, they were not destroying it. Xavier had known Erik Lensheer a long time. He was a man who never went into a battle without a grand plan. More often than not, only he knew the full extent of the plan. He let others take care of the dirty work until the time was right. If this were a game of chess, he would be setting up his attack right now. He just wasn’t sure what that attack entailed. “What is it, Charles?” asked Storm curiously. Xavier was silent for a moment as he gazed distantly at the layout of the garrison. He watched as reports came in from sentries manning the outpost struggled to fight back against the Brotherhood. Then one report in particular stuck out that led him to a number of ominous conclusions. Magneto’s forces were taking major losses as the sentinels continued their barrage with their new energy weapon. The once concentrated force of mutants was forced on the defensive as the sentinels remained well-above them, outside the reach of most mutants. Some that had flight powers were still able to attack, but they were outnumbered and easily singled out by supporting sentinel units. Injuries and deaths mounted, forcing some to take cover in debris, ditches, and even behind the remains of downed sentinels. But even as the battle turned against them Magneto remained as stoic as ever. “Keep fighting my brethren! Our victory is close at hand!” he proclaimed. “Is this guy on crack? !” exclaimed a muscular mutant with gray skin. “I don’t know. Maybe he’s delusional or something. Like he can’t accept defeat,” said middle-aged mutant woman. Confidence continued to waiver as another punishing blast from a sentinel struck just in front of a downed sentinel where a number of mutants had been hiding. The impact injured more and even killed a few. Those still alive struggled to find another hiding spot, but another sentinel had just finished charging up and was prepared to fire on them. When Lorna saw this she reacted swiftly. The mutants wisely listened. Then just as the sentinel fired another concentrated energy burst, Lorna ripped apart the panels of a nearby downed sentinel and formed a shield that protected them from the incoming blast. It didn’t stop the full onslaught, but it protected them enough to keep anybody else from getting killed. Unfortunately, the strain of resisting such powerful forces left Lorna drained. She couldn’t pull off too many saves like that. But Magneto remained unfazed. Now panting hard and seething with anger, Lorna looked up at her estranged father. Lorna couldn’t begin to contemplate how such heartless sacrifice could be justified. But before he could further explain himself, Magneto activated the radio in his helmet. “I’ll be ready,” said the master of magnetism boldly. As he continued to ignore Lorna’s disgusted looks, the old holocaust survivor used his powers to break off a chunk of the metal disk he and Lorna had been stationed on. With the force of magnetism as his guide, he flew over the battlefield where his mutant army was faltering and headed towards the garrison. “Father?! What are you doing?” exclaimed Lorna. While the battle raged outside, Mystique fought long and hard to make her way into the major garrison. As soon as Wanda dropped her in, she went to work. She shape shifted into an officer and swiftly made her way into the bowls of the garrison. It was cramped, dingy, and poorly lit. It was also being defended by people who had no place in such a battle. Most of Hodge’s conscripts were cowering in fear, having the choice of facing either Hodge’s wrath or Magento’s. It was not a pleasant sight, but it made her job easier. Getting into the communications area was the real challenge. Most of the battle-hardened soldiers were defending it, leaving the dirty work for the conscripts. She had to deceive and manipulate her way past several barriers. In one case she had to kill an officer and use his hand to open a scanner. Once she was inside it was just a matter of taking out the technicians and accessing the main controls. It took her longer than expected, but she was finally in position. She typed feverishly on the main console, sifting through layers of antiquated security and less than elaborate commands. As she worked one of the technicians struggled to get up. He had been kicked in the head by the shape shifter and was trying to get back to his post. Then he got a glimpse of what she was doing and gasped in horror. “I already have,” she said stoically. The shape shifter casually took out her gun and shot him in the head. He was right. She was going to overload the system. But that was the point. If Magneto was going to use these communication arrays in the way he planned, they had to be powered up beyond their limits. It was the only way he was going to get his message across to the world. Upon entering the final commands, alarms started blaring. Computer screens everywhere flashed red warning signs, signaling a total system failure and overload. “Oh no you don’t!” said Mystique. The shape shifter had just overridden the emergency commands. Now the communications equipment from every garrison on the island was linked up and overpowered. No doubt the crews from the other garrisons were panicking wildly. The system was officially theirs. Grinning in triumph, Mystique took out her communicator. Upon receiving Mystique’s message, Magneto descended over the garrison where the Brotherhood was still clearing out lingering resistance. They had already destroyed the sentinels guarding the area. All that was left were pockets of conscripts cowering in machine gun sentries and soldiers armed with RPGs trying in vain to slow them down. When they saw Magneto fly overhead it was a clear sign that victory was at hand. Nothing could stop them now. “There’s the big man!” said Toad as he pointed up into the sky. “Sweet! That mean we’re ready for the knock-out punch?” asked Avalanche. “Maybe they have, but the sentinels haven’t,” said Wanda as she pointed up into the sky. Unfortunately, she was right. Magneto’s sudden move drew the attention of a couple of sentinels. So they broke off from the main group attacking the mutant army and focused their sights on the master of magnetism. This did not go unnoticed. Magneto was just over the garrison when he saw this coming. If one of them fired their energy weapon, then this critical part of his plan may fall apart. “You heard the man! Pyro, you’re up!” said the Scarlet Witch. Shrugging casually, Pyro gathered all the flames around him and formed a massive fireball. 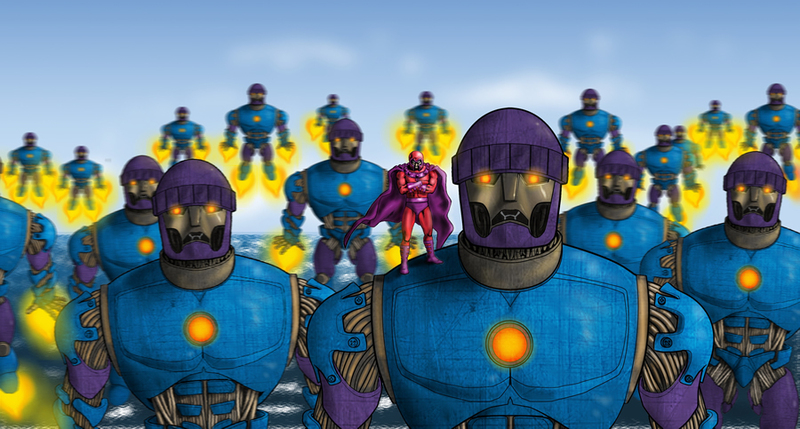 As it grew both sentinels began charging up their energy weapons and aimed them directly at Magneto. The rest of the Brotherhood watched anxiously as their leader summoned the full force of his powers and prepared to make his move. Just as the sentinels were about to fire, Pyro unleashed his fireball. “Burn you lousy tin cans!” he exclaimed. The fireball shot towards the two sentinels like a comet. It struck them at full force just as they were about to fire. It singed their sensors and disrupted nearly every major motor function. Even with the chest cannon fully charged, they couldn’t remain stable. A small explosion erupted within their legs around their propulsion system. Then with smoke billowing out of every crevice the two massive robot humanoids plummeted towards the ground. To make matters more complicated, they were heading directly towards where the Brotherhood was standing. “Damn your aim, Pyro!” cursed Pietro. “Everybody get back! I’ll try and deflect it!” said the Scarlet Witch. Wanda ran out in front of them, her eyes glowing with hexing energy as they fell towards them. But just as the sentinels were about to hit, the energy built up in their chest cannons gave out. Knowing Wanda wouldn’t be able to deflect this, Pietro reacted on a whim. Running at full speed, he swooped in and grabbed his sister just as they exploded in a blinding flash. Wanda didn’t even see it coming and was momentarily stunned by the burst. But Pietro got her just far enough to where she wouldn’t be incinerated. But in the process, he shielded her with his body and took the blunt end of the force. Everything after that went dark. For Wanda it all happened so fast. For a brief moment she couldn’t see, hear, or orient herself. She felt a pain in her chest where her ribs had cracked and a sharp sting in her shoulder where she was badly burned. All around her there was debris surrounded by charred earth. She was dazed and disoriented, but when she came to she was met with an ominous sight. Her brother was completely knocked out. “Hnn…Pietro?” she groaned as she tried to wake him. Then when she touched him she came to a horrifying realization. He was wounded badly with blood gushing out of half his body. He wasn’t moving. She couldn’t even tell if he was breathing. For all she knew, he was dead. Wanda ignored her own pain and quickly tended to her brother. She looked around for the Brotherhood, but they had taken cover. She looked up at her father who had seen the explosion, but hadn’t stopped what he was doing. But his daughter’s cries fell on deaf ears. Magneto wasn’t going to stop, not even for his own son. Wanda could only watch with tears in her eyes as her father continued fighting. He was going to do it. He was going to deliver the final blow even if it cost him his son. With seething determination, the master of magnetism shook the garrison to its foundation. Every soldier and conscript abandoned their post and took cover, watching as the structure of the building was literally ripped apart. From deep within the structure, Magneto extracted a large antenna array. This array was still overloaded from what Mystique had done earlier. Despite this grave state, Magneto overloaded it even more with a powerful magnetic pulse. Only this was no ordinary pulse. In a dazzling display of power, Magneto channeled his electromagnetic energy through the antenna to amplify the pulse. This way it would not only be unleashed here, but in every other garrison throughout the island. The powerful pulse shot out from every part of the island, striking every active sentinel. Their eyes started sparking in a strange way. For the X-men in the dome with the prisoners and the mutant army on the coast, it was a strange sight. Every sentinel just froze in place. It wasn’t like they were going offline. It was as if they were being overwhelmed by some strange signal. “What the hell is wrong with them?” asked Blob as he and the Brotherhood emerged. “What does it look like? Magneto’s jacking them!” grinned Toad. The advanced machines continued to falter, but the signal from Magneto was too strong for their system to ignore. But whatever backup system the sentinels had was stalled. Using the antennas as a medium, Magneto delivered a new set of orders. Only this time they weren’t from Cameron Hodge. Clenching his fists, Magneto summoned another round of magnetic energy. He along with every sentinel on the island was levitated high into the sky. The X-men and the prisoners in the dome watched anxiously along with the mutant army that had been so demoralized just moments ago. They all gazed towards the sky with a mixture of awe and excitement as the sentinels now swarmed around Magneto. A great cheer erupted from Magneto’s army and his Brotherhood. Only Lorna and Wanda were silent as they just watched their father take to the sky, now fully in command of the sentinels. Soon all the sentinels were lined up before him in a grid-like formation with him in the center. Now hovering high over the island, Magneto grinned triumphantly. Using the amplified signals from the antennas below, Magneto tapped into the live video feed capabilities of the sentinels. Then using his powers, he sent out a wave that would be picked up on every radio, TV, and satellite all over the world. Soon every station, channel, and communication line was his to tap. With this nearly omniscient reach, he delivered a message to all of humanity.